What is it about the record that will appeal to the fans? I believe this release is made rather for listeners and smaller clubs, than for peaktime dancefloors. However, all tracks worked very well for me when I played them out at several gigs lately. I could feel how the vibe and energy in the club changed in a very positive way, when I opened an afterhour set at Club A.R.M. (Germany) lately. Similing faces everywhere! How does it differ from your last release? 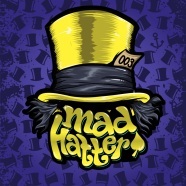 My last releases has been Mad Hatter 001 and was very different. It was rather a classic House track with a garagy vibe and spoken vocals. Different to the new Mad Hatter 003 it did not have many melodic and harmonic parts. On the remix duties we had Sascha Dive (Cocoon, Tsuba), who delivered a nice and groovy remix. This time we could convince Ron Flatter (Katermukke, Einmusika) to contribute an interpretation. He delivered a great, more peak time oriented, rework of Inno. What was the inspiration for this release? Actually both originals have been written last summer, the week I arrived back home after a trip to Ibiza. Onni was then completely reworked again in December, shortly before Christmas. In my case, melodic releases such as this single are influenced by taking a break and then going back to work, in order to turn experiences and emotions into music. If you had the chance to play this in any club, which would it be? I would love to play Inno and Onni during the summer months, of course early morning, perhaps outdoors at Katerblau in Berlin or a closing track on the terrace of Amnesia Ibiza.